← New Year New Resolution! Since the last News item we have been quite busy at South Coast Roof Training. A couple of weeks ago we had a visit from Flex-R Ltd with a view to running EPDM flat roof courses at the training centre, in conjunction with SIG. It is early days still, but we hope to have courses up and running by early summer. Keep checking the website for course dates. We also had a visit from SPRA (Single-ply Roofing Association) to discuss the possibility of running single-ply flat roof courses. This is currently at the ‘twinkle in the eye’ stage, so very early days. Watch this space! Last week we had the pleasure of welcoming James Mott of ProjectBook on a return visit to SCRT. He commented on the changes that have occurred in the training centre since his last trip to Littlehampton. 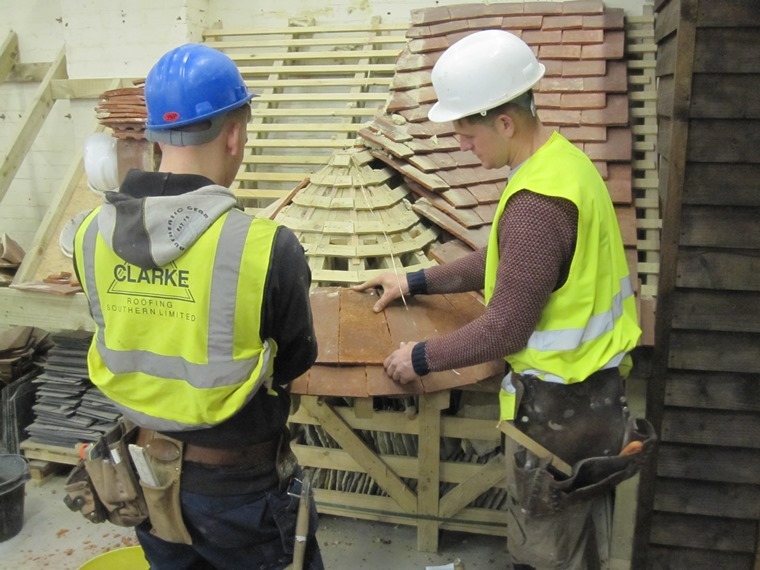 The Heritage SUP Roofing candidates (from Clarke Roofing Ltd) were busy working with plain clay tiles, donated by Keymer Tiles Ltd, on a curved roof and a swept valley. Doing this course has helped me understand different types and styles of roofing which I can take with me throughout my career as a roofer. It has shown me different methods that could have taken me a lifetime to learn. In my time on the course so far I have been taught traditional methods in the perfect environment, where time and cost is not an issue. The course gives you the knowledge of advanced roofing that might take a lifetime to learn on site. The Heritage SUP Roofing course continues on Thursday and Friday. New dates for the Heritage SAP Roofing course and Heritage SUP Roofing course will be available shortly. This week we have run a CrysticROOF GRP flat-roof course, in conjunction with SIG, which was fully subscribed.